Hardware What is the Intel Z68 chipset? Discussion in 'Article Discussion' started by arcticstoat, 13 May 2011. Another disappointing chipset release with pointless features. If I have an SSD I want maximum performance from it and I don't want to be limited to the requirements of this hybrid system. Internal graphics? Since when have Intel graphics been good for anything? I will be waiting for 22nm CPU's utilizing 3d transistors. If the Z68 featured dual x16 SLI then I would have been impressed. Not so sure if this is going to last that long with SSD prices falling and the technology improving. I could only see it perhaps being useful in a data server of some sort with multiple high capacity disks with a heavy read/write environment to improve performance, but then again you would need a UPS to prevent data loss in a power out as losing 20G of data is unacceptable. Don't see the point of these features really. Not to enthusiasts. yup. Optimus has a point.. in laptops. Because that is where you need it. Enthusiasts don't care about the power bill that much that they would go through hoops and lot of pain to save a few watts. Also the Smart Response is also pointless. I want consistent performance across all my data and I want control of what data has the SSD speed. This is doable with a average SSD (120GB now I think) and a large data drive. Just put the data you want fast access to on the SSD and leave the rest on the data drive. With symlinks you can fool Steam as well so you can have your favorite games on the SSD and the rest on the data drive. Agree with your analysis smart speedy or whatever its called. I'm a fan on intel, and it's great that it performs so well. But, as a premium player, my next descision is whether to buy a 240/512 SSD, whether to get a 30" monitor, and how long do I have to wait until the lga2011 hardware is available. As you suggest, I dont want to buy a premium motherboard with some money saving feature - just sounds like extra circuitry bloat to me... no thanks! With SSD prices coming lower & lower, its only a matter of time before everyone has them anyway. That's my view precisely, Intel shaved off ISRT from lower Cougar point controllers where it could've been more useful (H61, B65, H67 ...) , and could have attracted conservative and cost-focused corporate segment. In enthusiast segment, I see only one advantage of Z68 over P67 - backup integrated graphics... Quite costly if you ask me, it'd still be cheaper to keep an old graphic card in drawer. Personally I am doing what you suggested - a crucial m4 128GB boot drive (£170), and for my steam directory a 1TB Spinpoint HD (£40) + Vertex 2 60GB (£85) for cache. I figure £125 is reasonable money to make my games load fast. For me to have 1 drive for all would require something like an vertex 3 480GB (£1350) which is stupid money. The Nvidia driver handles everything and makes the switch at one point only, Virtu has several layers of abstraction in software, how could it not have overhead? Its entirely pointless! Also if the discrete GPU idles during 2D applications anyway, what is the point of running the intergrated solution on top of that, surely it should power the card down? This implementation irks me massively. The Smart Response thing I am interested in. I am thinking my Steam folder which has all my games, all my games have to be on that folder which would be a significant amount on an SSD, this way they are stored on a larger HDD but I could get a boost on those games I am playing regularly. How much is one of those 20gb 1.8" Intel SLC drives anyways? is TRIM important on the cache drive? what if i use an old SSD that doesn't support TRIM as cache? also, SSD have fast random read (great for small in-game object streamload), but if using an old SSD, its sequential read is actually slower than current top end HDD's. so which data source would IRST use? the fastest one or just the cache? The games don't have to be on the same drive (there are ways around it) but you have hit the nail on the head with regards to where the benefits lie. The major advantage to SRT is the transparency to the end user. Effectively you get the benefits of a SSD for your most frequently used programs (steam games, Internet, Productivity etc) and the storage space of a large HD all without having to worry about disk management. The drive(s) appear as a single entity in windows so you can just install away as if you just had one drive whilst enjoying the benefits of SSD like system response on the applications you use most frequently. To the consumer this is win win. I am at a bit of a loss why this has been limited to the Z68 chipset though. I can see why Intel would want to save some features for the "top end" model but this sort of technology would be perfect for the consumer level chipsets (H61/H67) as well as pretty much every laptop that can't have two physical HDs' installed. Smart Response sounds like a good idea for people who have lots of Large applications and don't want to spend loads on a big SSD. What happens if the Cache SSD fails? Will Windows just boot up normally if you remove the SSD? Hmmm, having read other test of Z68 I must say I'm missing a few points. Virtu 1)Your conclusion that using the PG-output only has downsides is correct...at least that's confirmed by other tests. What you (appearently) didn't test is working the other way around: connecting the discrete output only, and using the PG for quicksync. Virtu 2)When using the PG output, in order to know when to switch, you need to "whitelist" programme's...was ArmaII on your whitelist? If not, than no wonder it tried to run on you PG and not the discrete graphics. Where can I get a "Big" SSD for 40pounds? The Hardware Guide May has a C300 64GB for 100pounds, and I wouldn't really call that "big"
Your conclusion that using the PG-output only has downsides is correct...at least that's confirmed by other tests. When using the PG output, in order to know when to switch, you need to "whitelist" programme's...was ArmaII on your whitelist? If not, than no wonder it tried to run on you PG and not the discrete graphics. The outputs on the graphics card don't work once Virtu is installed as far as I know - it just shows a white screen. If someone's got it to work, then I'd be interested to know how. Arma II is a known application for Virtu, just as 3DMark 11 was, so there's no excuse for it not working. As to the SSD point, I think this might be a case of colloquial English - 'to put £40 toward' a big SSD means that you'd have an extra £40 to spend on an SSD if you didn't spend it on your motherboard. Eg, if you have around £300 to spend should you get a £110 P67 board a 128GB SSD or would you rather buy a £160 board and a small SSD? i've missed the point of the z68 entirely I think. I thought (hoped) that it would give you the ability to use the integrated GPU for GPGPU activities such as video encoding, then use your dedicated graphics card for gaming. 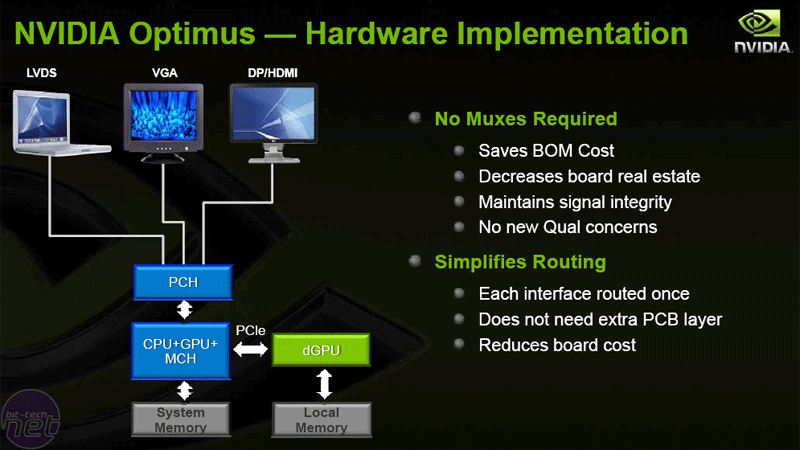 In other words use the GPU for ALL visual stuff, but be able to access the GPU for GPGPU tasks. The hybrid idea of switching seemlessly seems difficult to execute any way. Agree with the basic thoughts of the article. If you are an enthusiast and you are spending an extra 40-50 quid on Z68 plus buying a small SSD for around Â£50(? ), you might as well go p67 with a 120gig SSD and you will be only 30-40 quid worse off but with a PC that just works. @Wuyanxu - My guess would be that since the SSD is caching most used files, and those files will change a lot over time, that TRIM is even more important with this drive than ever. I've seen that running Virtu in D-mode, is really good, and only accesses the DG for quicksync. As it was rightly said, most power users dont really care about the increased power consumption, and are only interesting in accessing the quick encoding systems of the DG. Yep, Virtu has two modes: i-Mode and d-Mode. I-Mode is the supposed power saving mode that doesn't seem to work to well yet. D-Mode is the one everyone who already owns a discrete GPU will actually use: essentially, everything is setup and runs exactly the same as it did with p67, except you can use quicksync too. 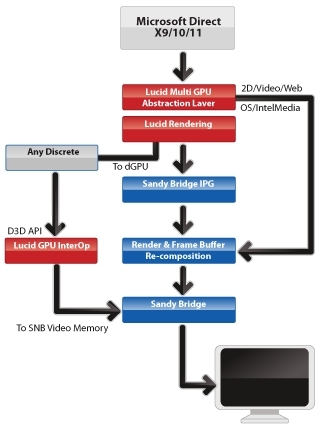 GDI compositing and games all still run to the discrete GPU, with the integrated GPU only used for Quicksync. An interesting test would be to use a big (120gb+) SSD with SRT: Use half the SSD for the Windows install and a few small programs, and the other half for Quicksync to accelerate any other larger programs (e.g. the Great Big Steam Folder) installed to a regular HDD. You get to have your cake and eat it too. I can totally spot what is unusual about that set up. 64gb Intel SSD does everything i need, enough room for all my applications and everything else is on a platter. Even 32gb would be enough for most unless your a gamer.